for more information or to purchase tickets. 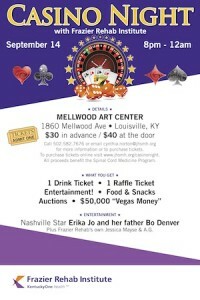 To purchase tickets online visit www.jhsmh.org/casinonight. All proceeds benefit the Spinal Cord Medicine Program. Plus Frazier Rehab’s own Jessica Mayse & A.G.